I recently opened a box of cigars to find a pleasant surprise. A small piece of paper inside let me know exactly when the cigars began aging, when they went in the box, and when they were released to be sold. 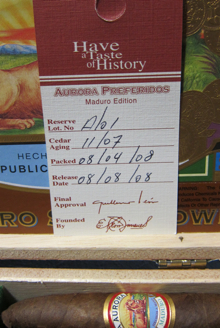 The box was a sampler of six La Aurora Preferido Maduro Perfectos. As you can see in the photo, the box includes a card with the pertinent dates and information about the batch of cigars. It’s such simple information—amazingly, though, such information is completely absent from many of the high-end cigars that are made these days. Nevermind information about when the cigars began aging, even box dates are missing from the majority of cigars on the market. Ironically, Cuban cigars always have box dates. Perhaps because they are often rushed out of the factory without extensive aging, it’s particularly important for Cuban smokers to know if their cigars have had enough time to develop. Box dates on Cubans also reinforce the collectors mentality that surrounds the smokes (while serving as a check against counterfeiting). It’s a lesson that non-Cuban producers would do well to emulate. For all the talk we hear about treating cigars as a collectors item like wine, consumers still don’t have the details they need to treat cigars like a collectors item. Good wines always have some basic information on the bottle; usually at least the vintage and basic information about the composition of the blend. Cigars should welcome that approach, even if it means dispensing with the idea that every cigar is best smoked immediately after it is released. Doing so would encourage cigar smokers to become collectors who want to learn more about the cigars they buy and how to get the most out of them through aging. Thanks for the great idea. This seems like something I would be interested in employing. I completely agree, I catalog all my cigars when I received them so I know how long I age them. It would be great to have stats on when the tobacco was harvested and how long the tobacco aged before and after rolling. It's a common sense request to have more information: better informed consumers make more ardent supporters. How long should cigars age before smoking? Patrick S, Thanks again for promoting sensible actions. I got a box of Vogel Green that had the information on small cards including who rolled the cigars, and it made the box more special to me. I got similar information when I purchaes a box of La Aurora Barrel Aged cigars. I chalk that up as another reason to purchase more La Aurora in the future. I certainly agree! I have recently become a cigar guy and I would love to know this information when I purchase cigars. It is hard to dive into the culture when so much information is excluded. Great work guys, keep it up! I really dig those cigars, especially the maduro line. Also agree that some data would be nice as well about our cigars. I agree that we need more information from cigar makers, but I'n not sure I completelÝ agree with the doc's petition. He emphasizes standardizing the info. I understand that makers want to proct the integriy of their blends, so personally I'd settle for having box dates and a list of countries where the tobacco comes from. Retailers are not crazy about this idea. If "word" got out that the May08 release of XYZ brand wasn't as good as the April08 what will the retailer do to move the undesirable product? In the wine industry it's easy, make a meritage and charge a premium for it, but its not that easy for a cigar maker. cigarguy, you are right, and it might be worse than that. Now there is almost no accountability: "X amount of years of aging, fermented x times, then after they are rolled they are aged x years in ____." Yeah, sure. None of that advertising would matter, if we knew a cigar that went out w/ this date on a box has the same name but is not as good as the so-called same cigar of a different date. It would not just be a concern of the retailer, because he could hold manufacturers accountable. The FDA might institute dating for traceability purposes as they do w/ medicine. I like the idea also and some of the concerns raised are legitimate but if manufacturers who don't provide the information start to see sales increasing for those who do provide the information then the "market" will have done its job. Worry about the feds later. Makes me like La Aurora all the more.